Amy Herzog’s slice-of-drama drama “4000 Miles” begins when 21-year-old Leo shows up unannounced on his bicycle in the middle of the night at his 91-year-old grandmother’s Greenwich Village apartment and spans the next several weeks during which they become unlikely roommates. Vera Joseph (Mary Louise Wilson) is a crusty but lovable widowed old Commie slowly losing her hearing, her words, her mobility, and her social circle. Leo (Gabriel Ebert) is adrift, estranged from his family back in St. Paul, and reeling from the sudden loss of his best friend Micah, killed in a freak highway accident in the midst of a cross-country bike trip. We also meet Leo’s semi-sort-of-ex-girlfriend Bec (Zoe Winters), an earnest athletic college girl whom Vera insists on referring to as “chubby,” and Amanda (Greta Lee), a bubble-headed teenager Leo picks up in a bar, probably because she reminds him of his adopted Chinese sister. Watching the play, I remained engrossed with the story, the playwright’s choppy, somewhat unpredictable choice of scenes through which the central relationship is revealed, and her lack of insistence that we find the characters likeable. The play doesn’t end so much as stop abruptly, not necessarily a bad thing. I wasn’t so crazy about Daniel Aukin’s direction. Mary Louise Wilson has played old ladies like this for years, and she could play Vera in her sleep. She doesn’t, but her performance depends on patently ladled-on old-lady mannerisms (shuffling walk, stooped shoulders) without the magnificent specificity Wilson brought to playing Big Edie in the musical version of “Grey Gardens.” And I don’t know if it’s the particular challenge of performing on the thrust stage at Lincoln Center Theater’s intimate Mitzi Newhouse, but it seemed ridiculous how rarely the actors made eye contact – Winters in particular virtually never looks at Ebert during the two Leo-and-Bec scenes. Afterwards, more things bugged me about the play. The characters seemed generic – not exactly stick figures, more fleshed in than that, but still compendia of buzzwords rather than individualized people. The best-drawn is Leo, in whom Herzog has created a recognizable 21st century character: an idealistic, good-hearted charming young man committed to adventure, blind to his own privilege, resistant to adult responsibility, and oblivious to his impact on others. He’s all about community gardens and reading Rumi poems and maintaining upper-body strength by seeking out the nearest climbing wall, although inevitably the $50 fee comes out of somebody else’s pocket. At first I thought it was commentary on Leo that he instantly refused his grandmother’s offer of a banana because of its excessive carbon footprint but a few minutes later accepts a cup of coffee, even though last time I checked there were no coffee plantations in the West Village. But throughout the play, indications of political sentiment never really push past superficial references. Bec’s declaration “I’ve built houses in Ecuador and taught English in Mali and installed solar panels in Kathmandu” supposedly tells us everything we need to know about her civic-minded values, but those are fill-in-the-blank shorthand expressions. We never learn anything more about what those experiences mean to her. It’s amusing and pertinent to note that New York Jews might view 20th century Communism quite differently than second-generation Chinese immigrants, but Amanda’s extreme reaction to seeing a book about Communism on Vera’s bookshelf seemed bogus. And although we know from the Sunday New York Times that Vera is based on the playwright’s own grandmother (Vera also appears in Herzog’s play “After the Revolution”), the fictional Vera mouths only the most general comments about Marx or her late husband’s expertise about Cuba, while her real-life counterpart Leepee Joseph apparently has a detailed engagement with, for instance, Occupy Wall Street. I suppose it comes down to the difference between playwrights who have political consciousness and those who have no particular politics but borrow the trappings in order to give color to an otherwise conventional living-room drama. I’m thinking of Lisa Kron’s rich and complicated “In the Wake,” whose characters reflected the author’s own spirited, non-dogmatic struggle to make sense of contemporary social issues; portraying their efforts to integrate their beliefs with their social behavior, Kron simultaneously sought out, articulated, and critiqued numerous points along the political spectrum. Herzog looks at politics from the outside. 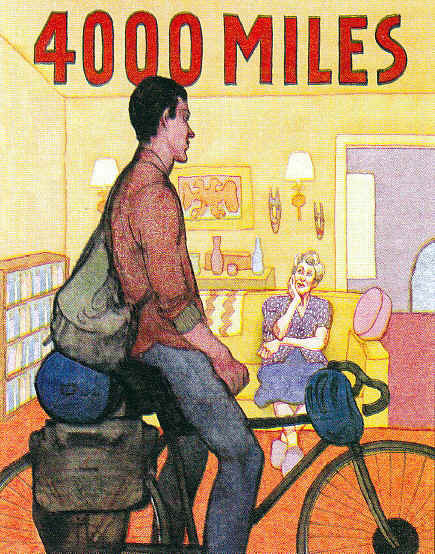 “4000 Miles” is warm-hearted and pleasant but a lesser play for exercising lip service rather than digesting real ideas.